It’s the time of the year when we want to spend more time outside than we do outside. So it’s natural that we want to decorate our outside spaces as well. All interior decorating ideas will have to wait for the colder seasons. And now, we’re going to get crafty in our backyard, patio or garden. The following are some awesome ideas to illuminate your outdoors and create a wonderful atmosphere for you to chill out with your family and friends. Use these easy but very creative ideas to make those long evenings that much more fun! Looking to build a DIY lamp or lampshade? To build a DIY outdoor chandelier, you will need a burlap ribbon, grapevine balls of different sizes, sets of 50-count white lights with brown wires, a garden twine and a birch branch. Thread the white lights inside each ball and tie them in place with the garden twine. Then, hang the balls from the birch brand to complete the ensemble. Finally, hang the chandelier from a suitable fixture using the burlap ribbon. You can also use the ribbon to cover things such as plugs. Follow the tutorial for the complete steps of this projects. You will need two wire hanging basket frames without the chains, four cable/pull ties, a can of spray paint, preferably silver, fairy/Christmas lights and pliers. Fasten the two basket frames together with cable ties (trim the tie tails) to form a globe/sphere. Then, paint the sphere silver and wrap fairly lights uniformly around it. You do not necessarily have to fasten the lights since their globes will help stop the wire from slipping. For more information and instruction check out the tutorial. The materials and tools for this DIY project include clear canning jars, indoor/outdoor lamp cords, translucent outdoor glass paint, drill and large drill bit. Cut holes in the metal caps of each jar using the large drill bit and paint the jars with different colors at the same time. Finally, screw each jar to a light cord. The tutorial will provide you with the full details. For this DIY project, you will need a chain, a thin metal rod, elastic bands, LED light and a basket/pot. Slip the thin metal rod through the chain ends. Wind the elastic bands around the ends of the metal rod to prevent the chain from slipping off and then hook the LED light into the middle of the metal rod. Place the rod and chain ensemble inside a pot. Finally, pull the chain through the pot’s drain hole. Check out the tutorial for more details. You will need cupcake tin liners, X-Acto knife, lamp cords, and bulbs. Use the knife to make crosscuts in the bottom of the tin liners. Next, slip the lamp cords on the liners. Finally, insert bulbs into the lamp cord sockets. Follow the tutorial for the exact steps of making this project. The tools and materials for this project include used pallets, a general use hammer, a saw, string lights and hooks. Pull the pallet apart and cut the boards into the required size. Use the 4×4 pieces of lumber to build the base and the ½” x4″ pieces to build four sides of the cube and the top. To allow light to pass through, leave spaces between the wood slats. Once you complete building the four sides and the top, attach screw hooks into the four inside corners the top. Finally, attach the string lights to the screw hooks. The tutorial will give you the full instructions and plans for this project. The materials and tools for this DIY project include inexpensive badminton shuttlecocks of different colors, 50-count white lights, and a knife. Remove the soft caps of the shuttlecocks and make a through the top of each shuttlecock skirt. Next, pass a light bulb through each hole. Finally, reattach the caps. Check out the tutorial for the complete instructions. For this DIY project, you will need rubber gloves, protective eyewear, glow sticks (different colors), clear glass jar and scissors. Crack a glow stick, insert the cracked end into a jar, and then cut the tip. Next, shake and swirl the cut glow stick inside the jar until a sufficient amount glow materials in the jar. Finally, replace the lid and shake the jar to disperse the glow material. Repeat this process for the other jars. Check out the tutorial to find all the details about this project. You will need a hula hoop, “icicle” white lights, rolls of romantic lace and a hot glue gun. 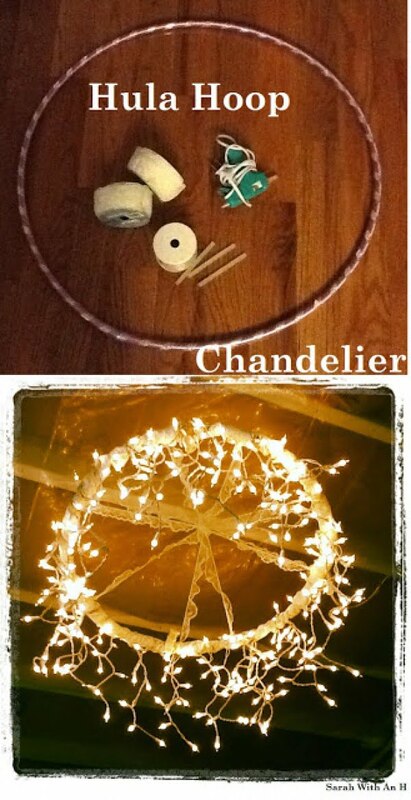 Apply glue on the hula hoop and then wrap the icicle lights around the hoop. Next, cover the hula hoop with the lace. The tutorial will explain you this project in detail. The tools and materials for this DIY project include an empty wine bottle, ½” copper cap, copper Top Plate Connector, ½” x 3/8″ copper coupling, 1″ split ring hanger, tiki replacement wick, torch fuel, adjustable wrench, power screwdriver, hacksaw and a funnel. Using the right tools, mount the Top Plate Connector where you want it to place the torch. Next, wrap the ½” end of the coupling with the Teflon tape and insert the wick into the coupling — ensure about a ¼” of the wick stick out. Next, insert the coupling and wick into the bottle to form the torch. Finally, hang the torch from the hanger. Check out the tutorial to see how exactly to complete this project. The materials for this DIY project include wood planter, fast setting cement, outdoor string lights, wood planter, hooks, WD-40, pliers, knife, and 5-gallon buckets. Cover the inside of the buckets with WD-40. Next, pour the cement into the buckets, add the right amount of water and mix thoroughly. Then, insert the tree trunks into the center of the buckets containing the cement mixture. Once the cement sets, remove the buckets and attach small screw hooks into the top of each trunk. Finally, hang the string lights from the hooks. Find all the details of this project in the tutorial linked above. For this DIY project, you will need PVC Pipes, a hacksaw, fine point sharpie, tape measure, sander, rotary tool, X-Acto knife and small lights. Cut the PVC pipes into the desired lengths, sand the rough edges and curve out your choice designs into each piece. Finally, stick lights into the inside of the designed pipes. The tutorial provided will give you all the details and exact steps on how to complete the project. 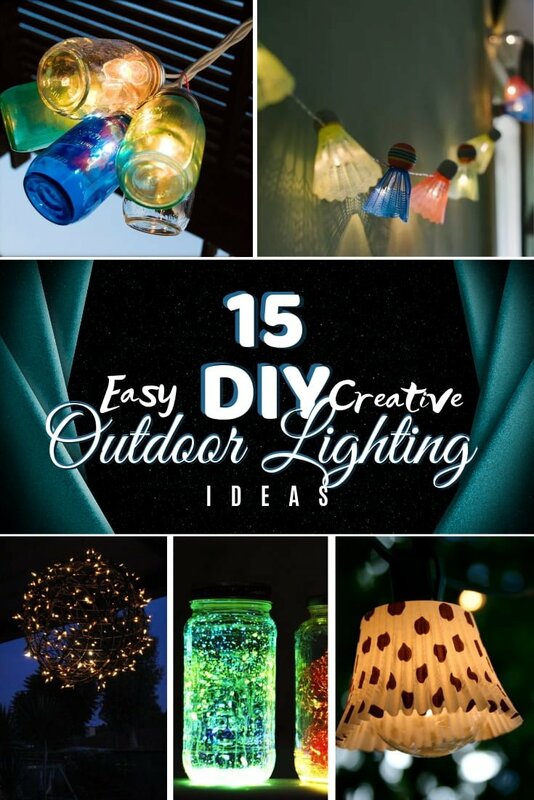 Pick up some inexpensive mason jars to make beautiful DIY lanterns for mood lighting in your backyard. It’s a small addition but they do look really lovely. See the tutorial for more details on how to make them.